In 2012, the Women in Rail initiative was established to bridge the skills gap in rail, and to improve the gender imbalance that exists in the industry. By advertising the railways as an attractive career choice to women, the railway is working towards facilitating industry access to a wider pool of talent, which further benefits the future of the rail industry. According to the initiative, less than a fifth of the roles in the industry are filled by women, and stereotypes still formulate public perceptions of the industry. Rail’s reputation is, fortunately, changing, but it is still unfortunately entrenched by outdated concepts of propriety, traditions and principles that led to the industry being commonly perceived as exclusionary to women. Luckily, the rail industry has collectively been working together to challenge this. 2018 has been declared as the Year of Engineering, and both men and women are playing a vital role in encouraging young people to consider a career in rail. This, coupled with the 100th anniversary of women achieving the vote, and indeed, International Women’s Day, the beginning of 2018 has been dominated by the industry’s efforts to encourage women into rail. Historically, the rail industry has been dominated by men. As a result, masculine principles have defined and shaped the industry since its inception. Indeed, the creation of rail was structured in such a way, that these principles even defined family dynamics at the time. Fathers and sons would follow one another into the industry as railwaymen and labourers, while the role of women was bound by matrimony; girls married railway workers, becoming caregivers, mothers and wives. As a result, the foundation of the railways was imbued by a definitive maleness; a strict hierarchy of rank and disciplinary procedures, modelled on the armed forces. Rail work was, unequivocally, man’s work and 19th Century propriety defined a woman’s place in the home – further shaping the attitudes of, and towards, the rail industry for centuries to come. Despite this, there is evidence that women were also present in the creation and operation of the railways. Helena Wojtczak, renowned British historian and author of Railway Women, wrote that in the 1851 census, three women were listed as ‘railway labourers’. Indeed, there were women hired by rail companies to perform duties that they could only do, but these were generally prohibited and defined by feminine propriety. For example, only women could work as ladies’ room attendants, or attend to female passengers. Only women could clean, launder or sew. Often, these roles were inextricably linked to a woman’s place in the home; only a railwaymen’s wife could obtain a position in the industry and thus, the role of wife became intertwined with a railwayman’s job. Conditions for Victorian railwaymen were bleak. But, for women, conditions were worse. Women were not only given the lowest status jobs, with no possibility for advancement, but they were also paid up to two thirds less than men. Women in rail were also excluded from joining unions, while railwaymen’s status and conditions improved. The admission of women into railway offices from 1870 onwards, gave some women access to labour and trade union movements – until marriage, when they were immediately dismissed. Before 1915, the exclusion of women in rail did not require any justification; a woman’s place was predefined by society, and the status quo went largely unchallenged. However, both world wars exposed new opportunities for women, which were seized upon with enthusiasm. During the First World War, almost one third of male railway workers joined the armed forces, leaving the country’s railways in crisis. While opposition to women in rail was fierce, and they were restricted in carrying out certain work on the railways, there was a stampede for jobs. The proportion of women working in rail increased from 2% to 66% in four years. 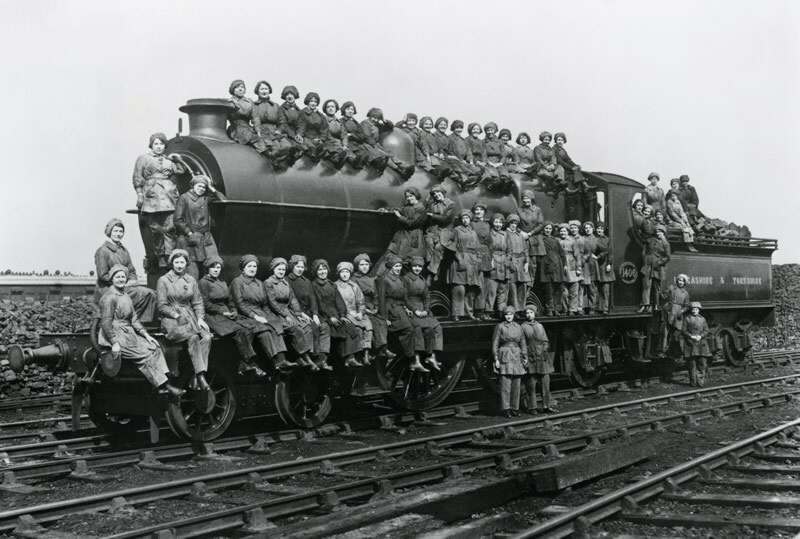 By the end of the war in 1918, almost 66,000 women were employed in the rail industry. Half of these women were uniformed, performing manual labour in roles previously considered inappropriate for women. According to Wotjczak, railway managers were impressed by the competence displayed by women during wartime. However, the same cannot be said about the railway unions and workforce. 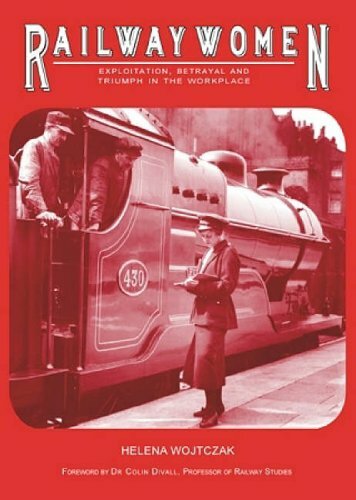 Women in rail faced overwhelming opposition, with railwaymen actively attempting to prevent women from being trained – even threatening to strike during wartime. The common assumption was that women were too weak; lacking the clear-sightedness and level-headedness required to work in rail. It was said that women would go to pieces in stressful situations – assumptions that were actively debunked during the war. When the war ended – after strikes demanding equal pay for women in rail, and many years of competent service – the 66,000-strong female workforce began to dwindle in numbers. 22,000 war casualties meant that there were some vacancies open to women, but the 35,000 women who had filled men’s roles during wartime, were dismissed. By the end of 1918, only 200 women were working in the rail industry. At the outbreak of the Second World War, the number of women in rail had grown. 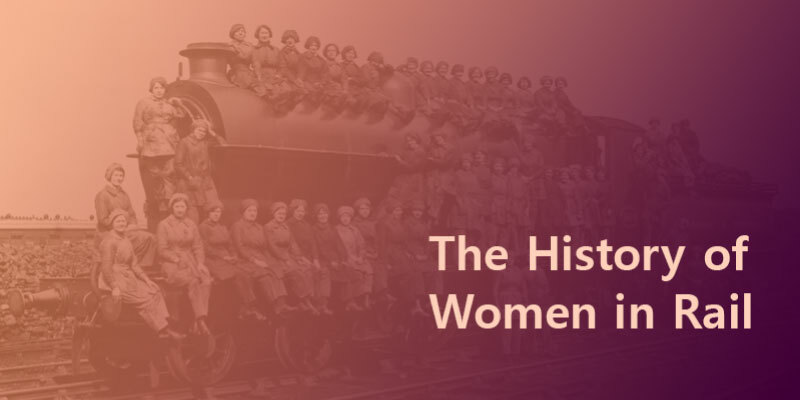 Alongside half a million men working in rail, 25,000 women were employed in various capacities throughout the industry. When thousands of men joined the armed forces in 1939, women were once again given the opportunity to support the rail industry. In addition to filling posts they had previously filled during the First World War, the range of tasks available to women broadened. Women were now employed on track, getting their hands dirty, in roles that had always been defined as ‘man’s work’. A female engine cleaner pictured in Heaton, Newcastle (1942) via Hastings Press. Again, women faced bitter opposition from men in rail. Women were being put in charge of trains along the south coast, midlands and London. While the railways across the country were under attack, these tracks in particular, suffered from heavy bombings, and the work being carried out was both extensive and dangerous. Women were operating power lathes, drop-stamp hampers and being trained as electricians, as well as climbing down between engines and carriages to uncouple trains. 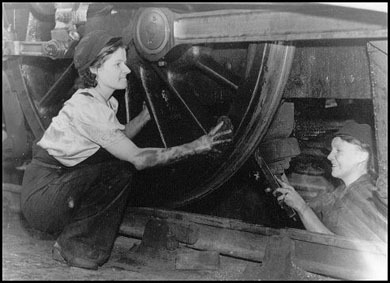 Bombings aside, women in rail were risking their lives every day, and in 1941, women were conscripted; they could now be forced to perform railway work. Despite conscription, and the success women had achieved during the war, once it ended, most women were forced to leave any uniformed job to make way for men returning from war. A handful of women kept their jobs, but they were usually stationed in rural or isolated settings – areas where men were not applying for work. There were also situations in which rail managers were keen to keep on war widows, especially those with dependents. However, union officials often applied pressure; complaining until these women were dismissed and replaced by, often untrained, men. Between 1946 and 1975, there was nothing stopping women from applying for work on the railways. However, as far as recruitment drives and posters were concerned, roles for porters, engineers, technicians etc. were considered ‘male-only’ roles, to be filled by men. There was an effort, in the 1960s and 1970s, by British Rail, to employ women as guards and signallers due to immense staff shortages across the railways. However, this again, provoked opposition from railwaymen, and so the idea was dropped. By the 1970s, women in rail were, again, confined to cleaning, catering or clerical work. Even then, women were hindered from career progression and promotions. In catering and cleaning, women were prohibited from supervising or managing men, and female office workers were stalled by their male colleagues, unions and managers. The employment of married women was openly condemned, and women were not allowed to work at night. In 1977, Karen Harrison applied for a job with British Rail. Harrison faced immediate struggle, even with recruitment officers, who upon discovering her gender, attempted to dissuade her from becoming a train driver – pushing her towards clerical work. Yet, Karen persisted, becoming the first female train driver in the rail industry’s history. As a great folk singer once sang, ‘the times they are a changing’ – especially in the rail industry. In the past few decades, women have been increasingly challenging the status quo across both industry and society. Sexist stereotypes and restrictions have ceased being an accepted barrier to women wanting to enter previously male-dominated industries, and the rail industry in particular, has been making strides in their desire to increase gender diversity across the industry. Digitalisation and industry modernisation has also created an immense number of roles where gender has become irrelevant. The steady introduction of computers, smartphones and technology, means that days of hauling coal and heavy lifting are over, and gender stereotypes no longer apply. As a result, the rail industry, once bound by 19th Century propriety and traditions, has been transformed. So, why is there still a gender imbalance in rail – why aren’t there more women seeking employment in rail? According to the Women in Rail initiative, lack of self-confidence is the most commonly cited insecurity for women in business – and the rail industry is no different. In workshops up and down the country, Women in Rail are aiming to challenge this insecurity. To further alleviate these insecurities and challenge the gender imbalance in the industry, closer collaboration with the likes of Newcastle’s Rail Academy and the National College for High Speed Rail, is potentially the most convenient and opportune time for women to join the rail industry. With immense change transforming rail’s physical and digital infrastructures, alongside an aging male workforce and increasing shortfall in skilled railway workers year on year, now is potentially the most opportune time for young women to consider a future in the rail industry. At OnTrac, we have been working alongside the rail industry for a decade, and have seen first-hand the positive change that gender diversity has brought the rail industry. Even within our own teams, we value and respect the equal rights of our female workforce, and encourage young men and women to get in touch, if they want to start their rail industry journey with us. We are recruiting for technical roles at the moment, and have recently joined the apprenticeship scheme. If you’d like to get involved in one of the most exciting and rapidly changing industries in the world, get in touch today.